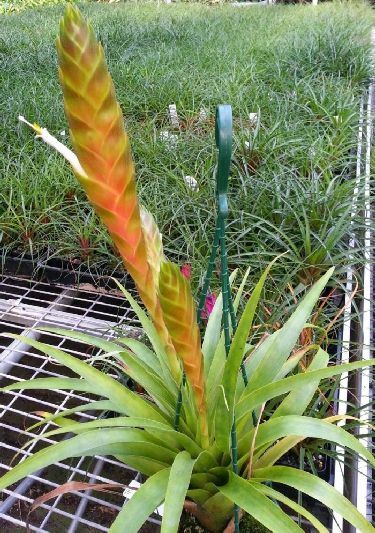 From Derek Butcher ... "Tillandsia ‘Werner’s Wonder’ appears to be uniquely Australian. Originally collected presumably in Guatemala. Exported by WK Bromeliads (Werner Krauspe) to Peter Tristram in ca 1988 with a batch of T. multicaulis but flowered with a peculiar habit. A larger plant can have a terminal spike (plus some side spikes like T. multicaulis) but smaller plants often only have a terminal one. Petals whitish. Flowering to 40-60cm high. Plant 40-60 cm diam. Clearly a natural hybrid with T. multicaulis the seed parent. There are several candidates for the pollen parent including T. lampropoda. Apparently this is also being sold as T. multicaulis x lampropoda which is incorrect. It is being grown at least in NSW, Qld and Victoria." 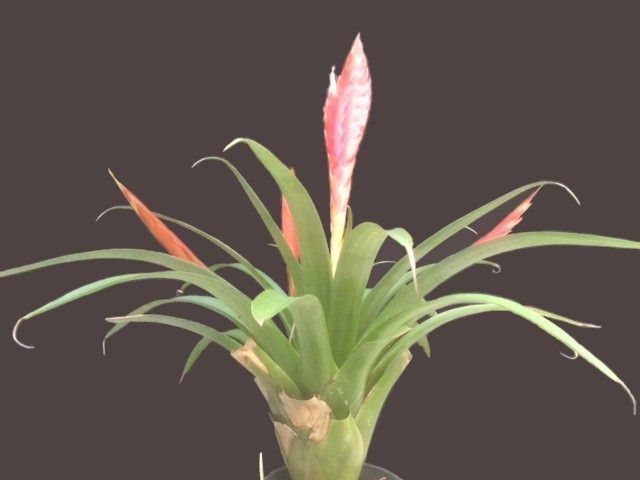 These pictures are of an assumed natural hybrid, sometimes in Australia as species nervata. John Olsen 10/15, as nervata. "First time for me with multiple paddles." Peter Tristram 10/15 ... "Hi John, this baby is now 'Werner's Wonder'. Harry Luther and I initially considered it could be close to nervata but when pups grew on and bloomed with multiple paddles it was considered a natural hybrid. The flowers have some purple too. 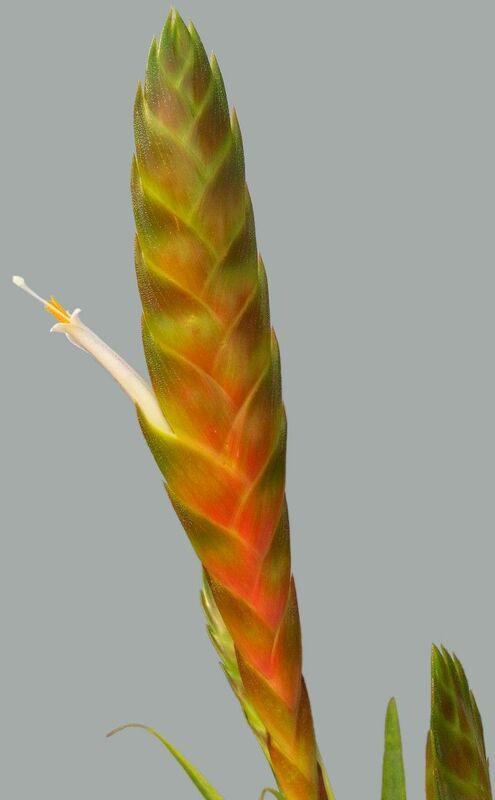 It is interesting that a nervata I got from the Palmengarten has a branched spike. I have one coming into bloom soon that recently came from Guatemala so we'll see what it's like. A kretzii I got for Chris bloomed more like a nervata (or verapazana). Confusing!" Peter Tristram 05/16 ... "The green-leafed species in the multicaulis/deppeana group, typified by their unusual flowers, include some quite common species and some seemingly very rare ones. Guatemala seems to be the hot spot for them. A few years ago I posted about T. nervata after I bloomed a plant from the Palmengarten in Frankfurt. Pics of it in the Palmengarten are on the dvd though Aussie bloomed ones of the same plant haven’t made it. This is likely because Walter Till suggested it ‘looks like an artificial hybrid’. Natural hybrid more likely! Well, Chris has posted pics too of likely nervatas (one obtained as kretzii that, at least, has a single spike even with his nutrient load and the other as verapazana) and I have now bloomed another ‘nervata’, collected in Guatemala, from a later import (ex Feldhoff via Germany). 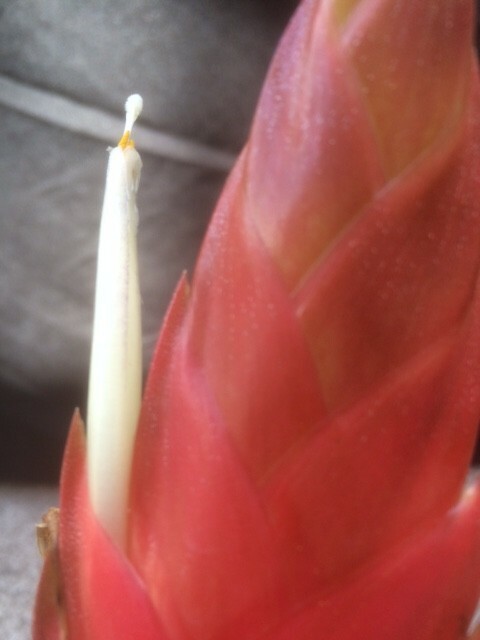 Flowers of this latest baby have never opened, only like the one in the pic. I have been waiting for cooler weather thinking this might be the problem. So what are these plants? I am also waiting for the Till study to see what material was used as nervata and to see what the phylogeny is especially in terms of evolution of this group. I have received some docs related to the project for editing so it won’t be long! Busy day tomorrow. Is nervata the same as verapazana? Is it a hybrid group? I also have a plant purchased as verapazana, ex Guatemala, coming into bloom. It will be interesting to compare." Chris Larson 05/16 ... "Gee the Palmengarten plant looks close to T. Werner’s Wonder. The number of sources of plants similar to T. Werner’s Wonder make me think that there is a species in there somewhere." Peter Tristram 05/16 ... "I decided to leave Werner’s Wonder out of the discussion! It has flower spikes more like multicaulis, not branches, but I sure see your point! 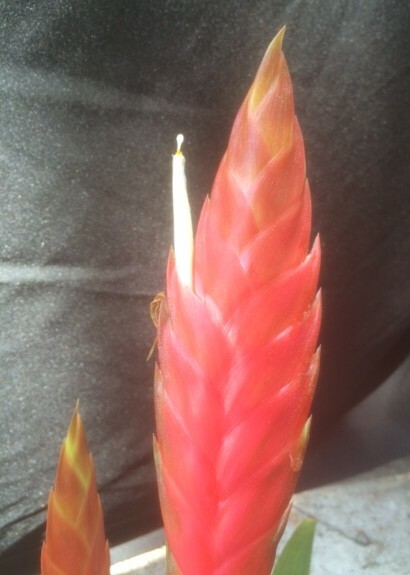 For new collectors, T. Werner’s Wonder appears to be a natural hybrid I imported from WK (Werner Krauspe) Bromeliads in California back in the ‘80s. Did you bloom any more of the supposed verapazana? Eventually we’ll need names for these babies!"